I just got my Z1012 w/ the CR3 battery. I've bought AA lithium batteries for my old Kodak digital camera. I've seen AA rechargeable NiMh batteries. Will these work w/ the Kodak Z1012 or do I have to buy the Kodak Brand rechargeable? I have had a Z712is since May 2007, and yesterday I received a Z1012is, bought mainly as a backup for the Z712, with which I continue to be very pleased. The battery issue has been discussed many times in these forums, but in many dispersed threads. I shall try to summarise. With this series of Z*12is superzoom cameras, the high current drawn from the batteries, especially on startup,drops the voltage of Ni-MH cells too low, and after only a few shots the camera will shut down, even though there's still plenty of charge in the cells. ....I've bought AA lithium batteries for my old Kodak digital camera. These are primary, disposable lithium batteries, and not to be confused with Li-ion rechargeable ones. They will work fine in the Z1012, and are among Kodak's recommendations. If you can find them cheap (not very likely), they are good to carry as emergency backup, and will last a long time. The disposable primary lithium CR-V3 battery is just a pair of these in a single package. They have a very long shelf life, and will provide hundreds of shots. I carry a throwaway CR-V3 myself, hoping not to use it until 2015, its 'use by' date. The best solution is Kodak's proprietary KLIC-8000[/b], which requires its own dedicated charger, because it has one contact on the side and one on the end. It has a very large capacity, and a terminal voltage of 4.2V fully charged on open circuit. At last I have one, as my Z1012 package included a KLIC-8000and mains charger. I bought direct from the Kodak online shop at the very low price of ukÂ£180 all-in. This is ukÂ£50 less than I paid for the Z712, which came only with a primary CR-V3. There are alternative 'replacement KLIC-8000' batteries and chargers on the market if you search for them. If you get a reputable one of these it should be fine, but be careful that it's from a source you can trust. The second option is 'rechargeable CR-V3' batteries from various suppliers. This is what I have used until yesterday's serendipitous acquisition of my KLIC-8000. These batteries are the same shape as CR-V3, but have their contacts for the camera on one end, and for the charger on one or both ends, i.e., there is more than one design. Obviously the battery must match the charger. CR-V3 throwaways were originally designed to fit in the same space as a pair of AA cells. The full 4.2V from a KLIC-8000 is overvoltage for some cameras that use AAs. So 'rechargeable CR-V3' batteries have a voltage regulator built in, which reduces the open-circuit terminal voltage, fully charged, to 3.8V. They usually have a third contact used only for charging, and the full 4.2V can be measured across this on mine. The lifetime before recharging of these is not as good as KLIC-8000, but I have found it quite satisfactory. I carry a second fully-charged 'rechargeable CR-V3' at all times, as well as the throwaway emergency backup. In the UK, the reputable retail store 'Maplins' has them on the shelves, at under ukÂ£20 for a battery &amp; mains/12V charger, and under ukÂ£15 for a separate battery. I had one battery failure in just under a year, and they replaced it without question. There are various other sources for rechargeable CR-V3 to be found online. Note that it is potentially very dangerous to attempt to recharge a primary lithium, throwaway cell. Those chargers that would allow this (i.e., one pair of contacts on one end) are best avoided unless you are careful and confident you understand! I hope this helps. Enjoy your camera! The throwaway batteries you already have, ssoman,will last for hundreds of shots, while you decide what system is for you. Done. This thread is now a sticky, with it's title changed to Z-Series Battery FAQ. Thanks, you saved me from a frustrating experience w/ the camera? Here is a photo of the generic charger and KLIC-800 replacement battery that I purchased from http://www.Sterlingtek.com about 6 month ago (around May or June 2008). It has performed perfectly. As a Kodak KLIC-8000 and charger came with my Z1012 package, I've been using one at last. I must say, the difference in performance from my pair of rechargeable CR-V3s isn't as great as I expected - I've seen the 'low battery' symbol surprisingly soon, surprisingly often. So this confirms my view that CRV3-sized Li-ion rechargeables will do, as an acceptable alternative to KLIC-8000 and direct substitutes (as shown above). I suppose it's possible the Z1012 is a substantially heavier energy user than the Z712, because of its bigger image files. I doubt if it's the post-processing overhead, as I seldom use any of the 'clever' software. Without a proper, instrumented, test discharger, it's quite difficult to assess battery life, as there are so many variables. Hi ! I just got myself a z1012 IS and , "unfortunately" bought a set of NiMH as well ! My question is , apart from not being recommended by Kodak and the obvious drainage issue, will they do any harm to the camera ? Thanks for the original post , it cleared so many doubts ! No, as I say in my first reply, the camera will switch on OK using fully-charged Ni-MH cells, but will shut itself down after only a small number of shots. So you can use them, very briefly, if you work quickly, but not for long. It won't harm the camera. If the camera shuts down and runs out of power in the middle of a 'write-to-card' operation, you may corrupt the memory card and have trouble retrieving its contents.So you can try it for yourself, provided you back up your images first. If you do, I'd love to hear the results. That said, the person (an expert photographer &amp; salesman) who sold me the Z712 insisted for a long time, in the face of my denials, that he had got hundreds of shots out of a pair of Ni-MH cells. I think it's just possible that he was shooting his model in one continuous shoot in a hot &amp; sunny location, and I'm in the chilly UK. He has stopped recommending them for these superzooms now. finally it's arrived, and with the camera I've found the rechargeable KLIC 8000 battery. 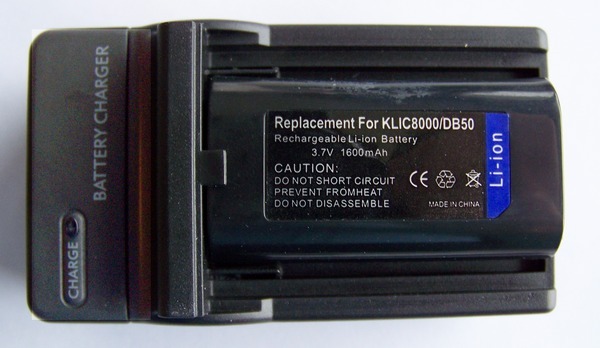 Now I've this question: it's necessary to buy another klic 8000 battery, or can I use only this one ? The number of shots you can take before you get the 'low battery' warning, followed a little later by shutdown, depends on how you use the camera. 'Continuous' rather than 'single' autofocus, lots of zooming in and out, and the flash are all heavy current users, and will limit the number of shots. However, there is quite a lot of energy in the KLIC-8000, and that would last all day, or longer, for many users. If you are disciplined enough to recharge the battery after every substantial photo-session, you could get by with just the one KLIC-8000. However, it's obviously a good idea, but not essential,to carry some sort of backup battery, so that you don't miss the shot that will make your fortune (ho! ho!). The cheapest, longest lasting, and least bother is to buy a single, long-dated, throwaway, non-rechargeable,primary lithium CR-V3 battery, and only use it in dire need. It contains even more energy than a fully-charged KLIC-8000. I am still carrying the one I bought for emergency use on my Z712. It's 'use-by' date is in 2015. A pair of primary lithium throwaway AA cells will do just as well. NO OTHER type of AA cell is suitable. Note that lithium (primary, throwaway) batteries and lithium-ion (rechargeable)batteries have completely different chemistries. Better, but much more expensive, is either (a) to have another KLIC-8000, or (b) (as I have) 'rechargeable CR-V3' battery orbatteries,and their charger, but that's a lot more hassle - two different battery systems and chargers. I you can get another KLIC-8000 or direct equivalent for less moneythan a throwaway CR-V3 or than a pair of throwaway primary Li AA cells, that's obviously the best solution. Make sure you buy from a reputable source, though, if you get a 'replacement KLIC-8000'. But if you remember to recharge your KLIC-8000 after every use, just that one alone will do nicely. Li-ion batteries only last a few years, however, whether you use them or not. They last best when they are half-charged, and stored in the refrigerator.